The European Eel (Anguilla anguilla); a creature shrouded in mystery and folklore. Their methods of capture invoking such ancient terminology as babbing, pritching and fyke netting. A wandering, serpentine, oceanic, catadrome, migrating in the early part of its life, from a vast Sargassum-fronded nursery in the North Atlantic, to its ultimate freshwater residence in the lakes, rivers and canals of Europe. Here it lives, matures and develops as a yellow (or green) eel, for up to 10-20 years, until such time as it is ready to return to its birthplace to spawn and eventually die. At this point of return to salt water, it has become the silver eel and the cycle reverses, with the Sargasso Sea becoming its final destination as it at last expires after spawning. I’ve never really had that much to do with eels. I’ve caught them on numerous occasions, both in fresh and salt water where usually and most annoyingly, they smash-up my tackle and wind monofilament leaders and main line around themselves into inextricable knots or fraps (as they say in Suffolk). Landing them is the next battle, again invoking considerable ire, as they wrap their writhing, slime-soaked forms into ridiculous and contorted balloon-animal-like shapes, usually up your arm, as you try to retrieve the hook. Yes, I can honestly say I’ve never been that huge a fan. 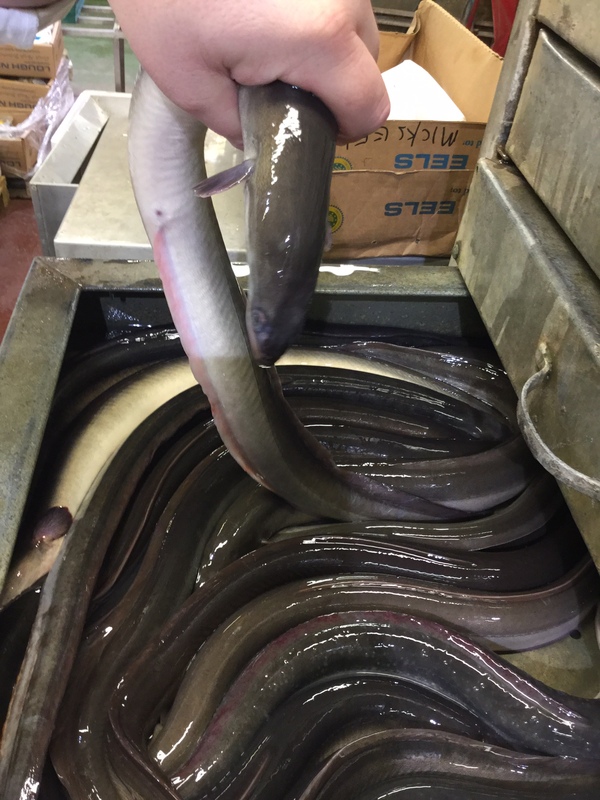 However, despite my tendency to dismiss them as water-vermin, I realise that historically, the eel has played a massive part in the diet and nutrition of countless Peoples over many centuries and has certainly guaranteed the subsistence of innumerable folk during times of extreme austerity. So is there still an appetite for the eel ? Having shunned the things for so long, I thought the time was now right to give the creatures the benefit of my doubt and investigate whether or not, in our modern century of exotic and eclectic tastes, if the eel still features in the original and simply cooked forms, that made it such a popular mainstay in the diets of the British population. So where to begin? 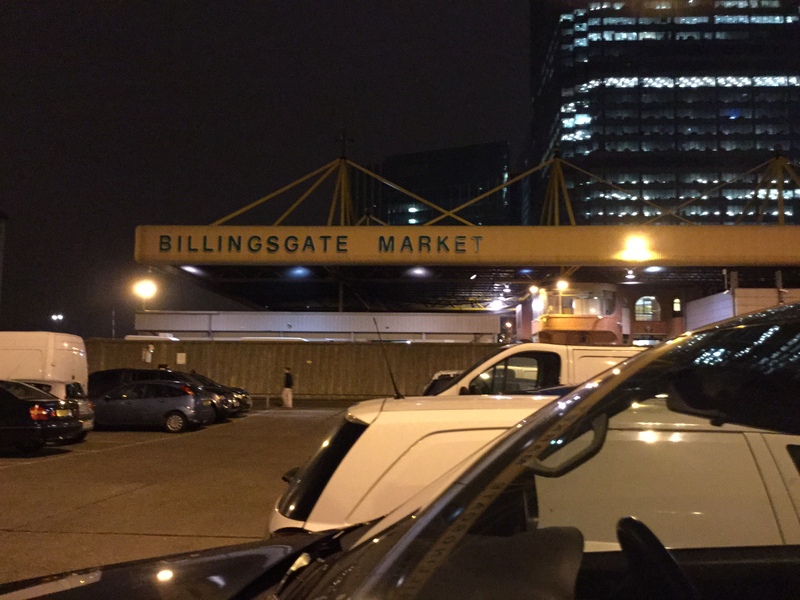 Well it had to be London in all honesty and to assist me in my quest, I enlisted the help of John and Nicola from Mick’s Eel Supply, based at Billingsgate Market and made what I can only best describe as a “pilgrimage”, to the most famous fish emporium on the planet. Arriving shortly after 5.30am, having wended my way down from Suffolk and duly armed with my market photography permit, I entered a world which has remained essentially unchanged in its function, for well over 100 years. 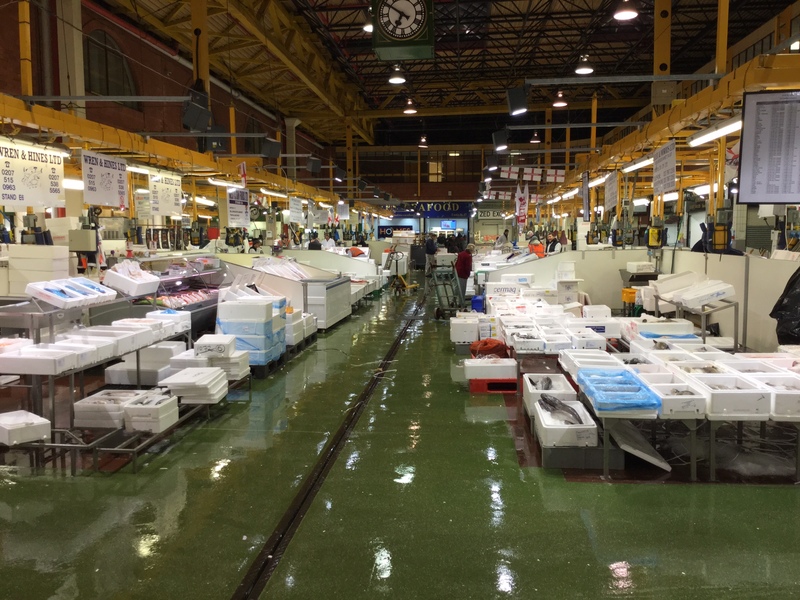 For a hopeless fish junkie like myself, Billingsgate provides an instant sensory overload, which left me quite agog for the first half-hour as I paraded up and down the glistening aisles, trying to absorb, not only the extreme quantity, but also the massive diversity of fish and shellfish on display. Too much to take in really. Porters; dragging pallet trucks of fish boxes in every direction, buyers; probing, haggling and negotiating and then the traders; pointing, waving, shouting, swearing and laughing, as money and fish changed hands accompanied by a constant, but not unpleasant, cacophony. 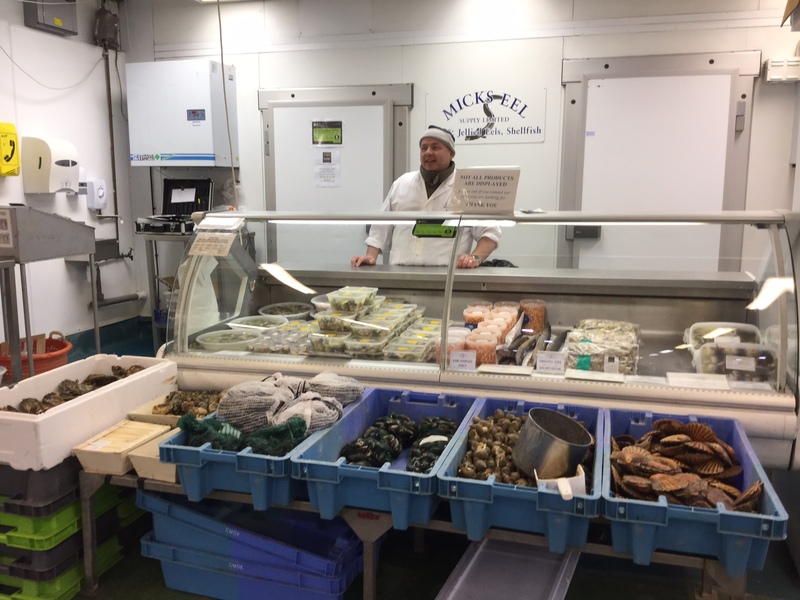 Having walked the entire market floor, I made my way to Mick’s where I was greeted, very warmly, by the ebullient John, who proceeded to brief me on all I needed to know about eels and how they fitted into the modern marketplace. 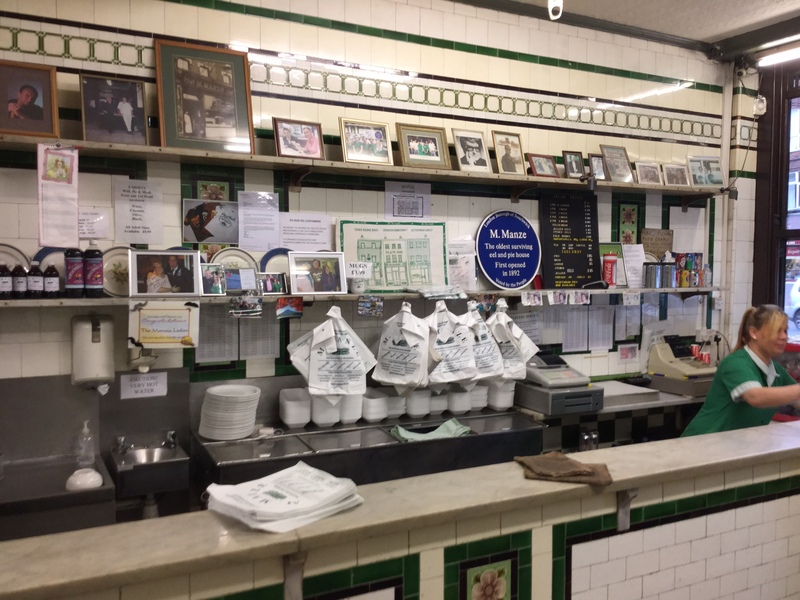 The prime and obvious market for John’s eels has been the traditional London pie & mash shop scene, where since the 1800’s, eels have been sold to a mainly working class clientele as a convenience food source. Their provenance has been documented widely and their sale and consumption has engrained itself into English culture as a well established and much-loved London institution. 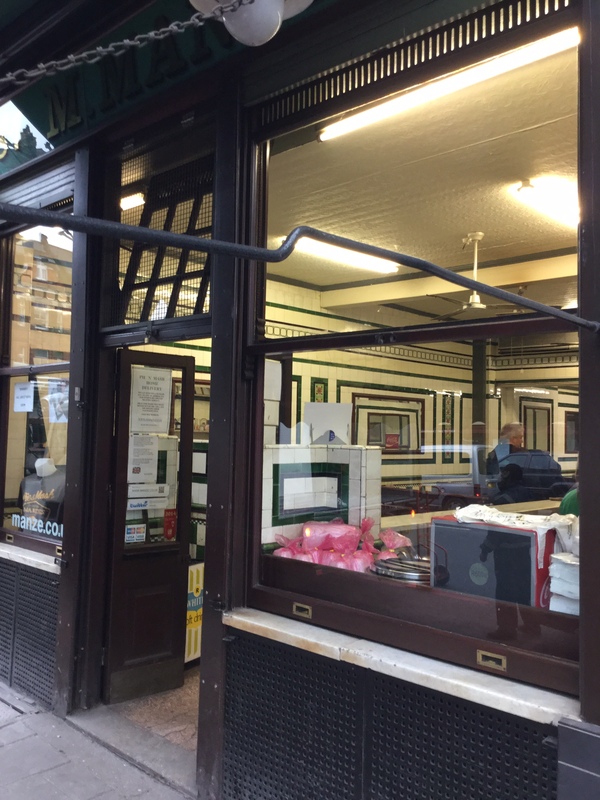 The origin of pie & mash or eel & pie shops dates back to Victorian times when a desire for a more respectable dining environment, led to their establishment, gradually replacing the stalls and sellers that had plied their trade on London’s streets for centuries. The eel itself had been an easily caught and abundant inhabitant of the Thames and Londoners had come to rely on it as an important source of cheap and plentiful nutrition. As the shops caught on, their popularity soared and they came to epitomize the dietary habits of the working class population. But what of them now? Do they and their robust and timeless menus have any place in 21st century metropolis? The only way was to follow the eel’s onward journey from Billingsgate, which by now was had emptied considerably and had begun the daily routine of cleaning down with a mixture of scales and ice being liberally hosed across the floor. Having given my thanks and made my farewells to John and Nicola and after a short hop on the DLR, I soon found myself striding across Tower Bridge en route to arguably the most famous pie shop of them all: Manzes on Tower Bridge Road. Michele Manze, an Italian Ice Merchant, arrived in London in the late 1800’s and began selling ice cream, but later diversified his business into purveying pies, mash and eels, which reflected the growing popularity of the shops. By the 1930’s the Manzes were running fourteen shops of which only two survive today, with a third, in Sutton having been opened relatively recently in 1998. 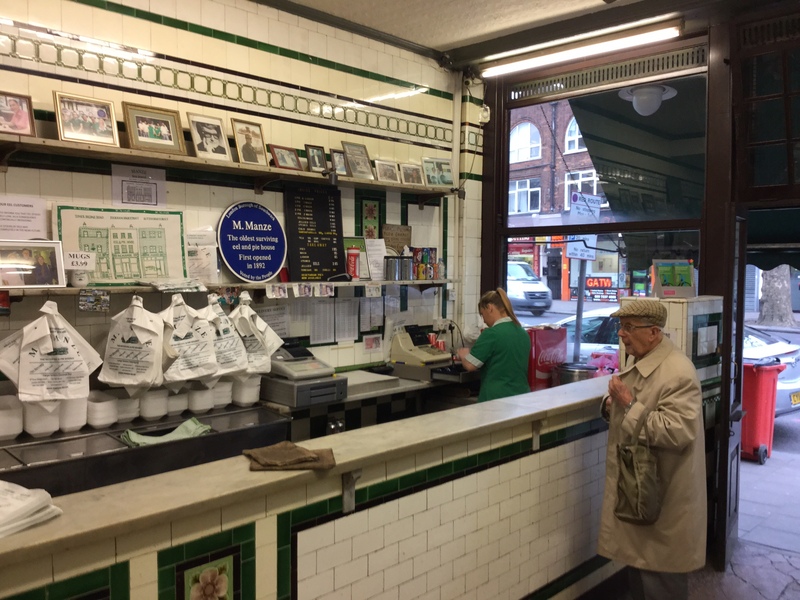 I felt I needed to sample for myself, first hand, what factors were woven together to constitute such an iconic brand and after a brisk walk down Tower Bridge road I found myself in Bermondsey and outside the oldest surviving pie & mash shop in the capital, at number 87. Entering one of Manzes’ shops is a bit like walking through a time portal or perhaps onto the set of an exhibit at the City of London Museum. Shades of the historical old town overlap with a delicious Victorian ambiance.The room is light, airy and extensively tiled with marble-topped tables that give a very ordered appearance. At the counter, having admitted to the staff why I’m there, I decide to order a representative sample of the menu, ending up almost instantaneously, with a plate of home-minced beef pie, a well-proportioned dollop of mash and on request, a bowl of stewed eels, both garnished with a necessary serving of liquor (a homemade parsley based sauce, originally made using the stock from the cooked eels). The pie is a hearty and wholly fulfilling dish in its own right, with a very satisfying and unctuous gravy complementing the meat. I decide to concentrate on the eels first as that’s what I’m principally there to sample and lest the volume gets the better of me. 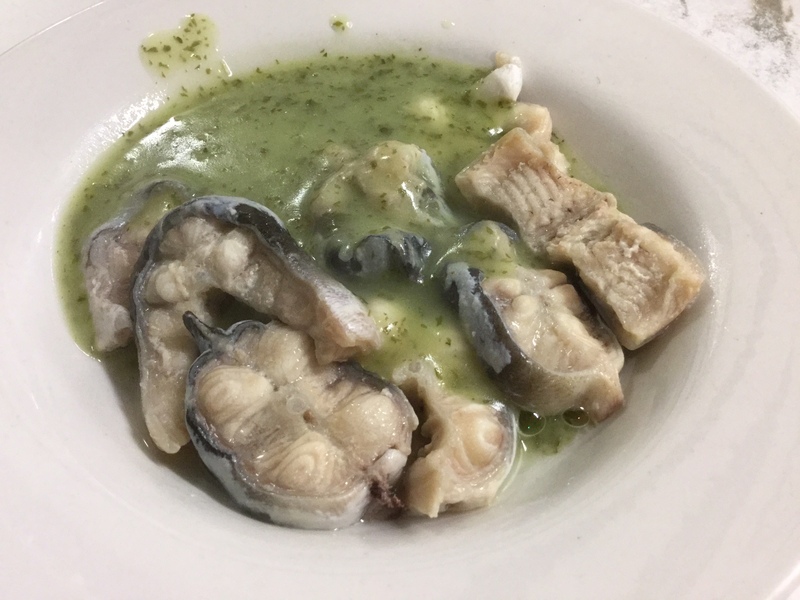 Not really having had any preconceptions as to flavour, I’m delighted when I discover that the eel meat is disarmingly sweet and once stripped from the bones, not dissimilar in texture to say gurnard or pouting, in fact quite akin. The liquor is flavoursome and benefits from added, in-situ, seasoning, although to my uneducated mind, it slightly detracts from the eel which I’m finding increasingly delectable. I savour each mouthful, although I’m aware that my technique is not in keeping with the traditional Cockney way of separating the flesh from the bones once chewing and then as I’m to learn later, returning the residue to the sawdust-laden floor with no further reference to the plate ! Eels consumed, I polish off the pie and turn my attention to quizzing the waitresses on their day-to-day experiences of working in one of the most photographed shops south of the river. I start to build a very interesting picture of the eel & pie consuming demographic: Predictably many pensioners, but also builders, taxi drivers, tradesmen and football supporters; the latter queuing up to 20 or 30 deep outside, when Millwall are playing at home.They offer a popular take-away service too, which I experience first hand from the steady stream of punters entering and leaving the shop. With my inquisition nearly complete, I have one last jigsaw piece to uncover.The final words of wisdom must come from someone whose family have been generational custodians of the great eel secrets and direct descendants of that original culinary entrepreneur, Michele Manze. So, furnished with the info that I need to catch a Number 78 bus from Griggs Place to Peckham Library, I embark on my final leg to Manzes’ Peckham shop and Head Office, to talk to family member Graham Poole on how he perceives the future for the demand for his eels. The Peckham shop, I learn, was devastated in the riots of 1985 when a fire next door spread into to the roof and caused widespread damage. The shop was rendered unfit and closed, with the Manzes, surviving on the trade from the Tower Bridge Rd premises until 1990, when it reopened. Graham goes on to elaborate on the customer type and how their demand for eels has changed. I ask whether the cultural diversity of the City has meant an interest from other ethnic groups? 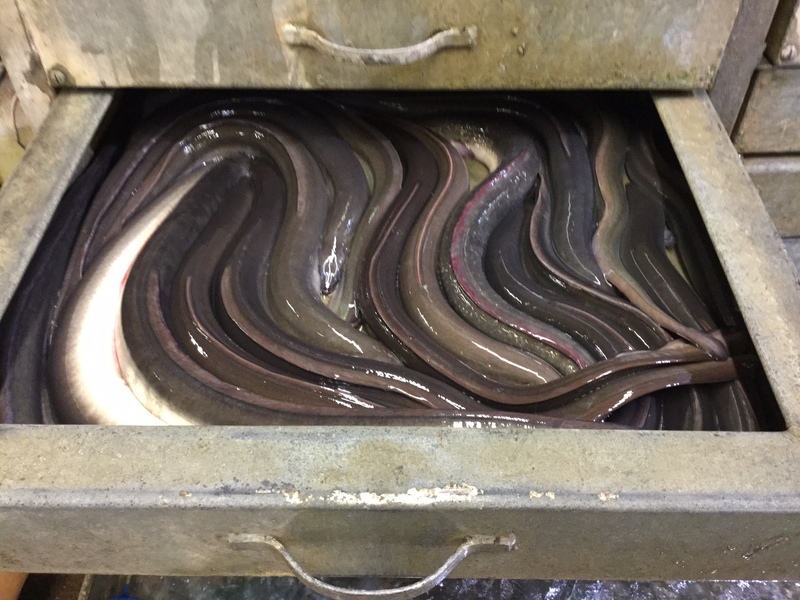 It appears, as John also pointed out earlier, that the other group of people most interested in eating eel, in all its forms, are members of the Chinese and South East Asian communities. Looking around as we talk, I can’t help but notice the numerous press cuttings, articles and celebrity photos that adorn the walls. The concept of the traditional eel and pie shop is obviously not lost with the media. 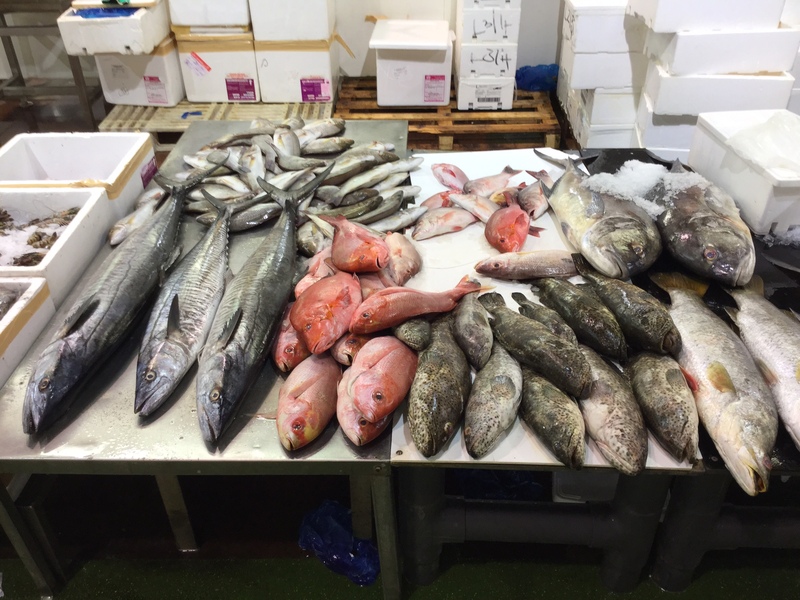 He then continues explaining the current market trends and the fact that much of the Manzes’ business is now conducted online, with different selection packs of pies, eels and liquor, leaving the premises via mail order. By now, I’ve spent all of the morning enveloped in a world that until recently I had a very limited and profoundly sketchy knowledge of. However, as I re-board the No 78 bus for my return journey into the City, I leave all the richer and replete, with a warm, satisfying feeling that I have now not only sampled one of the most iconic seafood dishes in the world, but I have witnessed and shared the passion and history of yet another branch, of the most fascinating of the food sectors.